There has not been commercial level production of sweet potato in south Texas for decades. 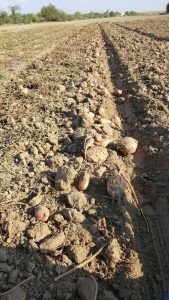 PPC Farms, an organic and conventional grower/packer/shipper of specialty vegetable crops in Mission, Texas conducted a one acre feasibility study of four varieties of organic sweet potato production. 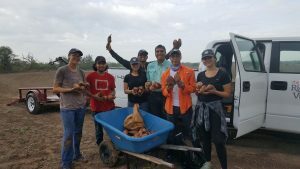 PPC Farms’ project objective was to explore whether sweet potato can be successfully grown in south Texas during the excruciatingly hot summer months, extend the growing season for the local organic farmers, increase crop diversity and income. 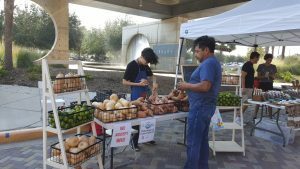 Organic Sweet Potatoes In South Texas? 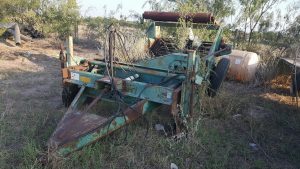 The objective of the proposal was to explore if the soil and climate of the Lower Rio Grande Valley are suitable for sweet potato production, machinery used in local agriculture could be adapted to plant the crop, local irrigation method was adequate, observe weed pressure, pest pressure, and explore what kind of pests are present in the Lower Rio Grande Valley. Region specific information and practices were to be gathered and explored. 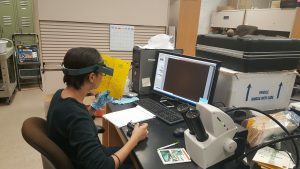 The field trial data was collected with the help of UTRGV students. Sweet potato originated in the tropical Americas and was grown extensively throughout the continent well before the arrival of the Europeans. 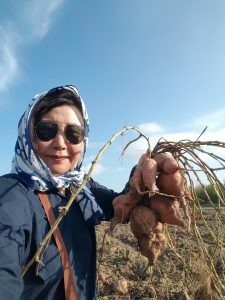 It was then introduced to Europe, Africa, and Asia and is now one of the major root crops in the developing world where over 90% of the production is found. In the tropics, sweet potato can be grown as a perennial while in temperate regions it is grown as an annual. Mission, Texas, where the trial took place is in the USDA hardiness zone 9b. Average first frost happens between December 21st through 31st, and the average last frost happens between January 21 though 31st. The ecoregion is 34e, Lower Rio Grande Valley. Heat zone days are 181-210 days over 86 degrees. Sweet potato needs between 90 and 150 days of a frost free period to produce harvestable roots. In theory, the crop can be grown in south Texas starting in February all the way until November. Sweet potatoes grow best in well-drained, loamy soils which result in larger and well-shaped roots. 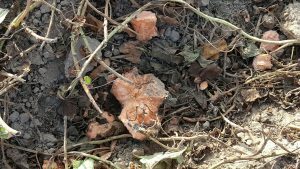 Sweet potatoes grown in heavy clay soils, or in soils with high soil organic matter can result in rough, irregular roots. We chose organically certified sandy loam field just north of the Rio Grande River as the location of our trial. Sweet potatoes do not require a lot of nitrogen fertility but do require significant potassium and phosphorus. The field of our choice had very high amount of the potassium and phosphorus, and extremely low levels of nitrate. The pH of the soil was 8.2, significantly higher than the recommended range of 6.0 to 6.8. 300 pounds per acre of sulfur was added to half of the plot as a soil amendment. Source of water was the Rio Grande River. The field was furrow irrigated, water pumped directly from the water source. Two-row disks were used to form raised beds. 8” ridges were created to improve drainage and root quality. Soil was plowed and disked to prepare a fine planting bed. The beds were 40″ wide. Sweet potatoes are grown from slips. Slips are shoots containing some roots which are pulled from growing plants. These slips had to be purchased from outside of Texas because there were no organic sweet potato slip available. 2000 slips each of Beauregard, Georgia Jet and Covington varieties were purchased from Steele Plant Company in Tennessee. 100 additional Murasaki slips were ordered. Beauregard was chosen for its promised highest yield potential. In Kentucky yields have surpassed 500 boxes per acre. Beauregard matures in 90 to 95 days. It has copper-red skin with orange flesh, and is the most common variety grown. Georgia Jet promised great taste, but may crack, negatively affecting its yield potential. It has bright orange flesh and red skin. It promised maturity in 90 days. Covington is a variety developed by a scientist at North Carolina State University. It promised highest quality but with lower yield potential than Beauregard. Yield is estimated at 400 boxes per acre. It has rose colored skin with orange flesh. It reaches maturity in 100 days. Muraski has purple skin and yellow flesh. Very sweet and popular with the Asian population. It promised maturity in 90 to 110 days. 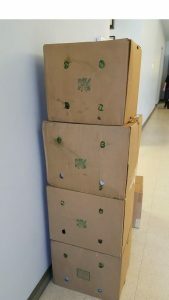 The slips arrived in ventilated cardboard boxes, bunched and roots wrapped in wax paper. The delivery from Tennessee to Mission, Texas took four days via UPS. Organic slip supply is very low nationwide. If you want to guarantee sourcing, you might have to get on the waiting list before the season starts. 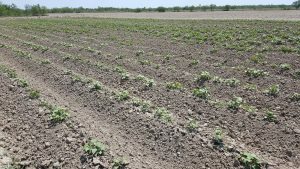 No slips are available during first three months of South Texas growing season Feb, Mar and April. Once the slips arrived, they were separated into different varieties. In the first planting, we used the slips straight from the box immediately after their arrival. In the second planting, we dipped the slips in water for one hour. The second method improved the standing significantly. Using a tomato transplanter, they were transplanted in a single row, 12” apart as recommended by the slip supplier. 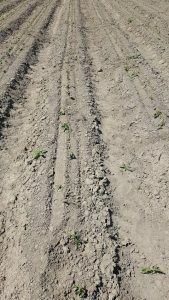 It is recommended that sweet potato slips are transplanted into rows at a depth of 3 inches with no less than 2 plant nodes in the ground and leaving at least 2 leaves or more above the ground. The slips should be refreshed by dipping the roots in few inches of water before transplanting. If you are unable to transplant immediately, the slips should be able to hold their freshness if you keep them in one inch of water. Common local agricultural machinery was adequate for transplanting. Literature kept talking about tobacco transplanter, so initially we were not sure if we could actually do it. We used tomato transplanter we owned. Once the slips were transplanted, the rows were irrigated through flood irrigation method. In our first planting, we started flooding the field once the entire field was planted. In our second planting, we flooded each row as soon as the slips were transplanted. The second method was much more successful for getting strong stands. Proper irrigation improves slip establishment. 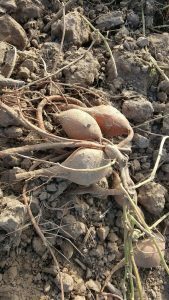 Irrigation of sweet potatoes need not be as frequent as for other vegetable crops, but is helpful during bulking stages. Excessive irrigation will cause splitting and cracking. We applied one inch of water every ten days throughout the growing process. Because the soil is very hot at the time of transplanting, it is better to fill the furrows as the rows get transplanted. Do not wait until the whole field to finish if you have the option to start bringing water. One inch every ten days was be adequate. Sweet potatoes are an aggressive crop that can quickly form a canopy, shading out weeds. Because our production was organic, we did not apply any herbicide but relied on manual cultivation. Some of the weeds that infiltrated the fields are sunflowers and solanum elaeagnifolium commonly known as silverleaf nightshade. Hand weeding done only once. Sunflower and silverleaf nightshade showed up. Pheromone insect traps were put out monthly to collect data on insects that are above ground. No pesticide was used during the study. 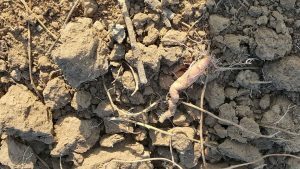 Sweet potato weevil was the main cause of damage. White fly was present but did not seem to affect production. Whitefly and sweetpotato weevils were present, the latter causing crop damage. Further study is needed if pesticides or other organic methods can prevent or mitigate damage to crop. The number one pest for the sweet potato for the tested sites were feral hogs. Hoof marks were noticed once the plants became established. The damage to the crop became apparent as the field matured. The most amount of damage was done at harvest time when continuous rain in September rendered the fields too wet for people and machinery to enter. The hogs devastated the fields. Feral hogs are major threat to crop in test sites. In order to harvest the sweet potatoes, a potato digger was borrowed from another farmer. Harvest was delayed due to weather conditions and availability of tractor and crew as the time frame coincided with our onion planting time. One tractor was too weak to pull the digger against the friction the roots were creating. We had to get a second tractor to help move it along. The digger’s bars kept snapping, especially when we were harvesting Murasaki variety. The Murasaki failed to bulk up during our trial, and made long rope-like roots similar to burdock. Georgia Jets grew faster than the other varieties. Because we harvested everything at once, the Georgia Jets were over-grown. The sizes were very irregular, even within the same variety. The harvest was suddenly interrupted with a heavy rain that continued for the next two weeks, which made the fields too wet to enter. We gathered all we could under the circumstances, and retreated. By the time the field dried, we found that feral hogs had done their damage. The field that was partially harvested was completely run over. The exposed sweet potatoes were all gone. Few days later, a group of UTRGV students came to the field to help salvage what was left. They were able to get some, but we could not collect data on yield. Our trial field was destroyed by feral hogs. We saw that there were some secondary growth happening from the remaining vines. 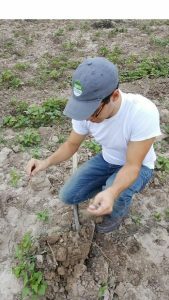 Having read that sweet potato was a perennial crop in the tropics, we decided to leave the field to see if we could get a crop by leaving them alone in south Texas. Continuous exposure to the hogs, combined with multiple freezing incidents, made the field overrun with weeds. Eventually the field browned completely. The field was terminated at the end of February. US parks and wildlife placed hog traps right at the location of our trial in order to study the migratory patterns of the hogs. Apparently our field location was a hog hot spot. 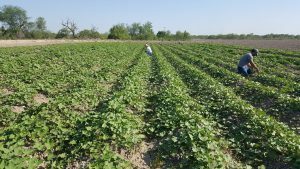 No commercial slips are available nationwide for the first three months of south Texas growing season Feb, March and April. Dipping the shipped slips into water prior to transplanting is recommended. Hot summer months between May and September are good for sweet potato growth. Highly alkaline local soil still allowed for good production. Furrow irrigation is a adequate method of irrigation. One inch of water every 15 days is adequate. No herbicide necessary for weed control as the vigorous plant growth quickly crowded out weeds. Main weeds were sunflower and silverleaf nightshade. Main insect pest present were whitefly. 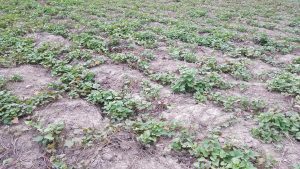 Main insect damage was done by sweet potato weevil. Major crop damage was due to feral hogs. Special harvesting equipment is mandatory necessity. The varieties tried did not follow the suggested maturity dates. Yields were not able to be established due to prolonged wet weather which halted harvest mid process, and the subsequent feral hog invasion. 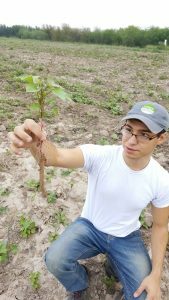 1 Students from UTRGV gathered samples of sweet potato and insects for research. 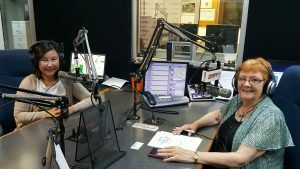 Appeared on KTVU The Garden Gal radio show with Barbara Storz. Talked about organic farming in south Texas, SSARE grant that allowed sweet potato research, promoted the field day. The show reaches 10,000-11,000 audiences. 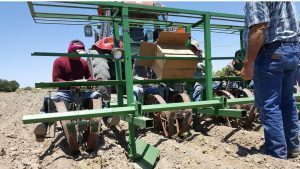 Demonstrated how purchased slips could be transplanted using our regular transplanter. Attended by 40 people, including farmers, researchers and USDA and TDA. 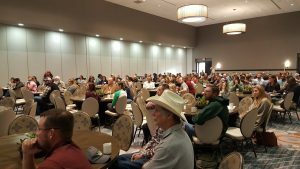 Hosted a farm tour at the conference. Arranged for 25 farmers and ranchers to visit the site. SARE’s Brennan Washington visited our site. We borrowed an old potato digger for a trial harvest. Upon successful operation, we were planning to host a harvest field day. However, it started to rain during the harvest. For the next two weeks, it rained continuously. The field was too wet to enter. After the field dried, we came to see feral hogs have destroyed all the partially harvested field. Another problem we ran into was, the potato digger was too old and the iron bars kept breaking off. We could not host a harvest field day due to this. 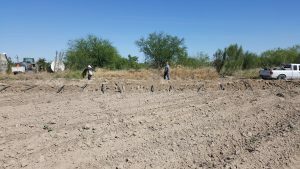 UTRGV sustainable agriculture students visited the trial site to manually collect what was left after the hogs destroyed the field. The students took the sample to see if there were any apparent difference in flavor. 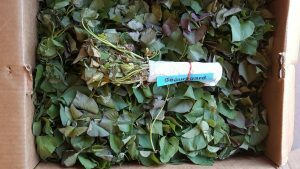 Brought samples of harvest to the farmers’ market to bring awareness to other farmers and public for local sweet potato production. This reached 100 people and 6 farmers. 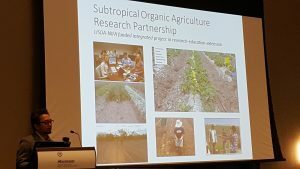 Dr. Alexis Racelis included the SSARE funded sweet potato research during his presentation about the Subtropical Organic Agriculture Research Partnership. Dr. Racelis was the advisor for the PPC Farms’ trial, providing research support and video production. This reached 300 farmers and gardeners. Quasi instructional video detailing all the ins and outs of the project was produced and submitted to SARE as well as shared on Youtube. 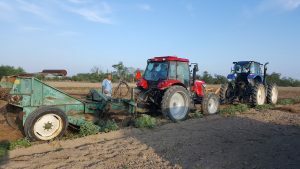 Production- Farmers gained knowledge and confidence that organic sweet potato production can successfully be initiated with existing farm equipment during south Texas summers. Slips- Most farmers in our area had never seen sweet potato slips. The exposure alone to the slips, and seeing the slips planted using a regular trans planter was an eye opener to the participating farmers. 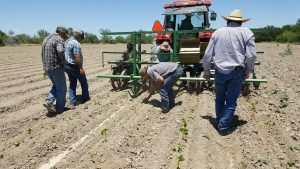 Skills- Farmers learned of land preparation, spacing and irrigation methods for summer time organic sweet potato production in south Texas. 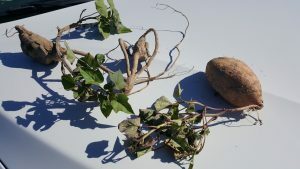 Weed management- During our test production, we discovered that sweet potato plant growth was very rigorous, needing little weed management. With minimum hoeing in the initial stages, the one acre field was quickly established, needing no further weeding. 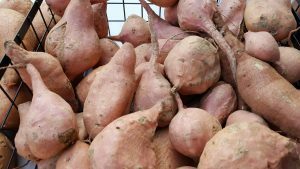 Seasonal Awareness- By the time the sweet potato slips are available for purchase, south Texas growers would have lost one to two months growing time. Although our May planting time was the best that we could have done, it seemed to most observers that earlier planting would have been better. 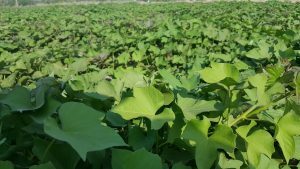 Awareness for need for local slip production- Since our region is located much more south of other sweet potato production areas, in order to have the slips in the timely manner, the farmers became aware that slip production needs to happen in south Texas. 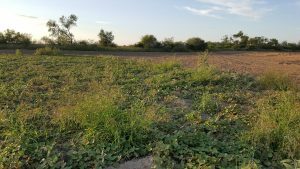 Sweet potato as cover crop- Many observers, including university researchers, noticed the potential for sweet potato as a summer time cover crop for south Texas because its need for very little water and weeding. 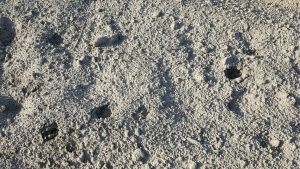 Pests- It was discovered that weevils are indeed a problem in south Texas. In our test production, we did not apply any pesticides. Samples were collected for observation only. Harvest- It was discovered that farmers do not have ready access to commercial harvester in the area. If we were to repeat the production, it is imperative that we secure a proper harvester as manual methods do not work. Variety- Varietal comparisons were made. Murasaki was inappropriate for the region as it produced rope like roots that broke down the old chain digger we had rented. 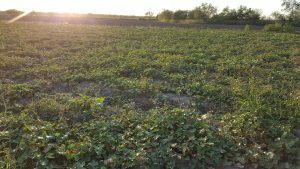 Growing organic sweet potatoes during the hot summer months of south Texas heat helps to keep the ground covered. 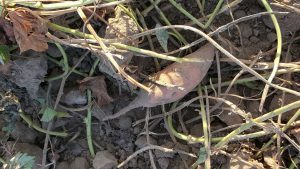 Sweet potato can be added to the list of warm weather cover crop for our area. Soil erosion is prevented because of thick and robust foliar growth. 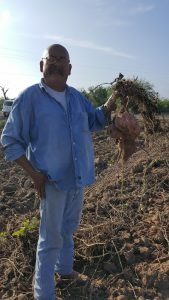 Was able to prove and educate via field days and demonstrations that successful organic production of commercial scale sweet potato production is possible in south Texas. Demonstrated local furrow irrigation method is suitable for production. Gained valuable experience and information regarding weed control need. Gained valuable information regarding presence of weevil in imported untreated slips. Determined that local growers can offer the crop to local markets during summer when very little else is available. Growers who serve the local markets can add sweet potato to their summer time crop, increasing production and sale. 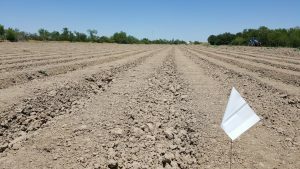 Further trials are needed to closely study varieties, planting time and pests to find optimal production suitable for south Texas.